Who doesn’t love chalkboard paint? A quick coat can transform anything into an imaginative canvas. Paint a tabletop, a piece of furniture or an entire wall! It’s cheap, easy and undeniably fun! Need a little inspiration? Whether you’re designing a nursery, updating your big kid’s space, or finally pulling that playroom together, these creative chalkboard paint ideas will definitely put you in the DIY mood. Bust out the chalk my friends. It’s go time. Help your kiddo keep his clothes organized by labeling his dresser drawers. You can even draw pictures for the benefit of little helpers who are still learning to read! Bring your child’s creativity to new peaks with this beautiful, chalk-paint mountain mural. Create a one-of-a-kind block city with these easy-to-make, chalkboard blocks. See the full tutorial right here. Many parents love the idea of a nursery mural but worry that their child will outgrow it. Looking for a design with staying power? Opt for a chalkboard accent wall, and hire a local artist or student to draw you a whimsical scene using semi-permanent chalk paint. When your child is ready for a clean slate, scrub off the chalk paint and let them do the decorating! Have something to boast about? Label your little one’s trophies and treasures with this beautiful, chalkboard display case. Find Ashley’s detailed how-to on Shanty to Chic. Turn a thrift-store find into a beautiful piece of art with this simple chalkboard globe tutorial. Start the school day with an inspirational quote or friendly reminder scrawled onto this adorable headboard message center. No headboard? No problem! With a little chalkboard paint and a steady hand, you can draw a bed fit for a princess! Not much of an artist? Take it step by step with Emily of Fly Chicks. Turn a cheap IKEA table set into an elegant art station featuring a chalkboard surface. Photo by Sweet Little Peanut via Pinterest. With its playful mix of artwork, accessories and hand-written references, this baseball-themed chalkboard gallery really knocks one out of the design park. Photo via Lisa Leonard Blog. Create your own woodland-inspired nursery art using chalkboard paint and pre-cut tree rounds. See how it’s done right here. 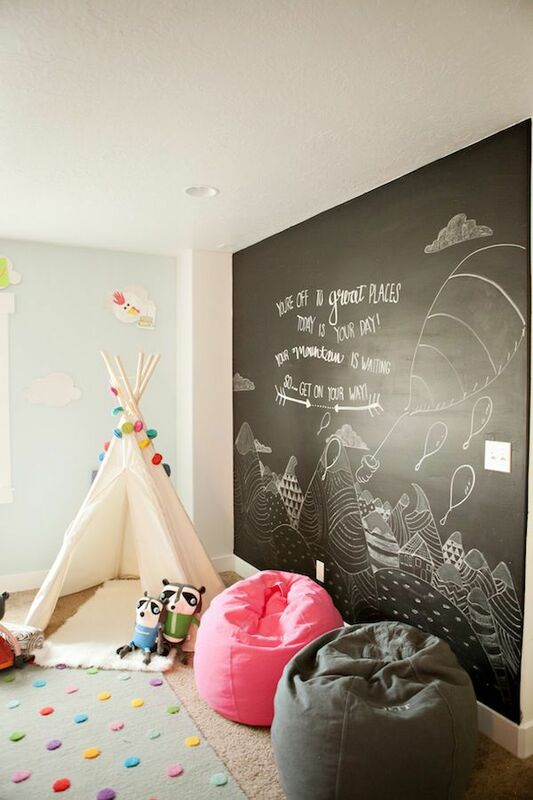 A quick coat of chalkboard paint is all it takes to turn the wasted space behind your child’s bedroom door into a creative play zone. Looking for more creative DIY ideas? Check out our DIY project page!